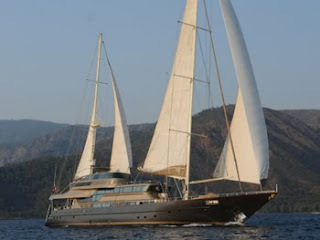 The perfect venue for corporate charters or large families and groups. Princess Zeynep offers spacious accommodations for 24 Guests in 12 Imperial Guest suites, 5 of which are located on the main and upper deck levels. Imperial Guest suites, elegantly and spaciously designed, are furnished with settee, dressing table and wardrobes and are equipped with audio-video entertainment center and mini-bar. En-suite bathrooms are fitted with exquisite granite. All suites have one King size bed and 6 also offer an additional single berth. Soft tones and stylish finishing details complementing the glamorous interior of Princess Zeynep flow effortlessly throughout the yacht all the way from the cockpit to the suites. In the main saloon you will find a comfortable bar lounge and formal dining area as well as large screen TV entertainment center. Also covered with a glass-top this area opens the gateway to the incomparable star gazing experiences under sail enriched with culinary pleasures of the highest standards. Princess Zeynep brings her Guests a step closer to the ever so glamorous starlit skies, with the panoramic view from her full beam fly bridge. Whilst the Jacuzzi and the bar of the fly bridge will make alfresco relaxation away from the sights and sounds of the world beneath an addictive indulgence. Water level aft platform hydraulically unfolding brings out your private beach on board. Secluded and intimately reserved for your dining and fishing as well as water sports activities.